AGES OF THE MOON will be staged early next year in an off-Broadway venue. The Atlantic Theater Company has announced its 2009-2010 season, which will include Sam's latest play about male bonding. It will run from January 9 through March 7, with an official opening on January 27. The production is to be directed by Jimmy Fay, who directed the play’s world premiere at the Abbey Theater in Dublin earlier this year. The play will also be returning to the Irish capital with a two-week run from November 13 to November 28 at the Abbey. Theater critic Peter Crawley describes the play as "an intelligent balance between a nameless American frontier and a more identifiably Irish stage tradition." I believe the film owes much of its success to its casting choices. Most critics agree that Sam was perfectly cast. 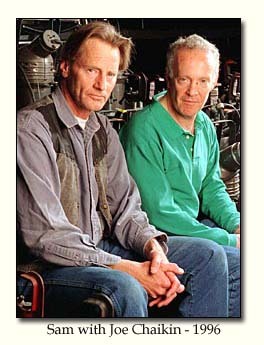 For the director, choosing an actor for the role of Faber was crucial. 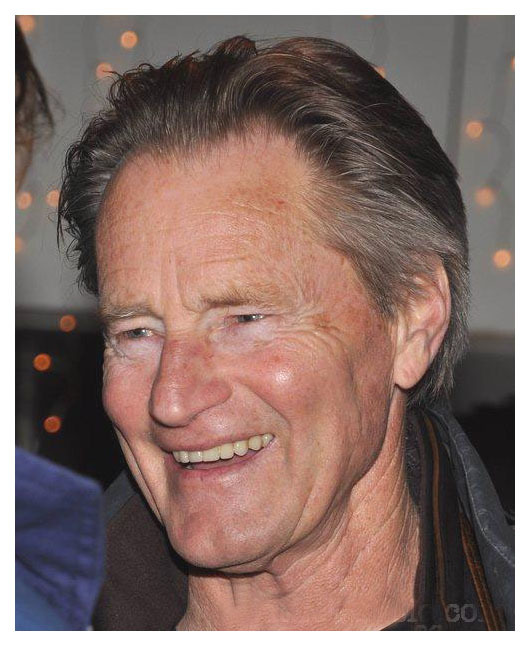 Schlondroff considered William Hurt but ultimately decided on Sam, partly because of his "unorthodox acting habits." I think Hurt was an excellent second choice because he too can easily slip into the role of the intellectual loner. The casting of Julie Delpy was pure magic. It is easy to see how her seraphic beauty as well as her vitality and enthusiasm rekindle those long-dead fires in Faber. Film critic Michael Wilmington said it best with "Wurlitzer writes Faber as a hipster Gary Cooper, a rough-hewn, homespun, educated roamer full of salty, wry comebacks. Shepard responds with one of his best performances, maybe his very best. His comic timing has a lazy perfection and his collision with Delpy, who seems as fragile in his arms as a bird being cradled against the wind, brings out a tenderness, a quiet exaltation and remorse that make both his role and the movie memorable." 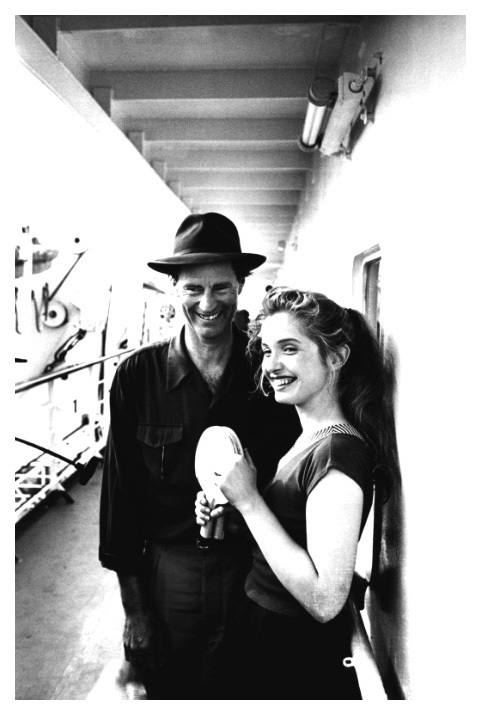 While promoting the film back in 1991, French actress Julie Delpy, was asked if her co-star was difficult. She responded, "No, but maybe I am used to this. He didn't try to rewrite everything. Sometimes he made changes in the dialogue, but we all do this. 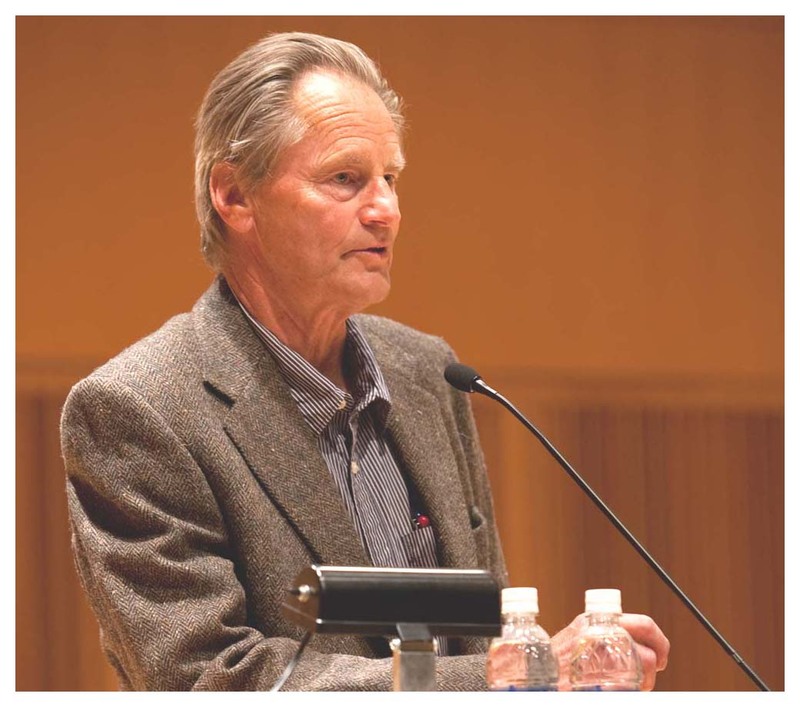 He wasn't pushy like 'I'm a great writer, and this is the way it should be written.'" However, she did have some comments on his privacy issues. Julie remarked, "He can be tough on people around him, but with me, he was nice. He is more than an actor, he is also a writer and sometimes he is very secretive. He goes away alone and sits in a corner and writes things down. He is much more private than an actor can be." Since the film was shot in several locations - Mexico, New York City, Paris, Paris, Italian cities Perugia and Rome, and finally Greece, Sam had a bit of traveling and the director shed some light on the actor's flying phobia. Apparently, it's not that he's afraid of flying as we've read in the past, but that he's afraid of the confinement for so many hours. I can easily relate to that feeling. Certainly, Sam deservedly garnered much praise for his acting (read critiques here). From the Seattle Post-Intelligencer, William Arnold wrote, "The film is also worth seeing for the best performance to date from actor/playwright Shepard, who guides us along this travelogue with a wonderfully wry voice-over narration. He captures every psychological level of this prototypically (and anachronistic) American character without a single false beat." EW's Owen Gleiberman wrote, "Shepard gives a perfectly accomplished performance as a man who never quite expresses what's on his mind." How true! 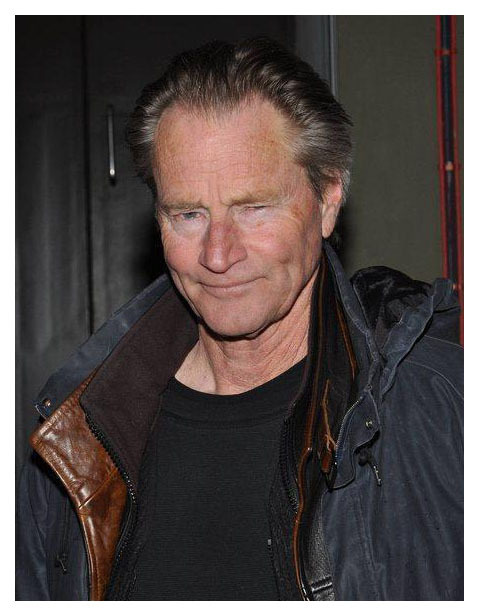 And that was never more evident in the 1997 film, "The Only Thrill" with Diane Keaton. In his review of that film, Kevin Thomas of the LA Times wrote, "The chiseled, laconic Shepard is the actor of choice if you want reticence in spades... Frankly, it's hard to imagine the film working without Shepard, who can suggest so much that's knotted up behind a stoic facade. "The Only Thrill" offers Shepard one of his most substantial screen roles, right up there with Volker Schlondorff's neglected 1991 'Voyager.'" Amen! Seductive and provocative, VOYAGER is intelligent cinema that comes highly recommended. Alas, it is disappointing that the film is only available in VHS format in the US & Canada. In December 2007 a Region 2 version was released by Arthaus Films in Germany. A blogger recently described an encounter with Sam during the filming of BROTHERS in Sante Fe last year. Apparently they wanted a certain house for a scene in their film. 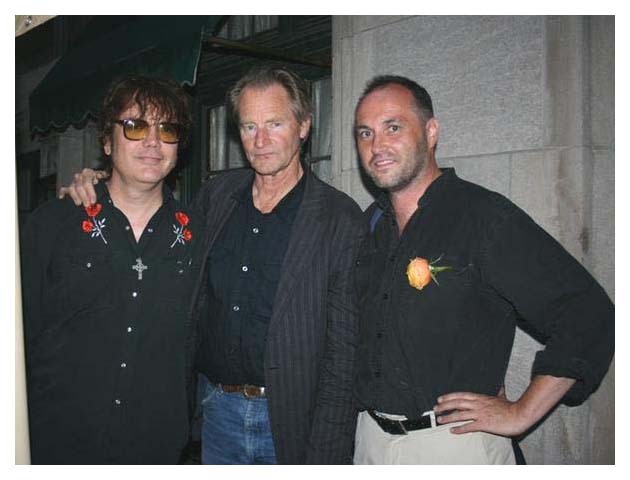 I guess I'd let the movie crew use my home as well if it meant meeting Sam Shepard. 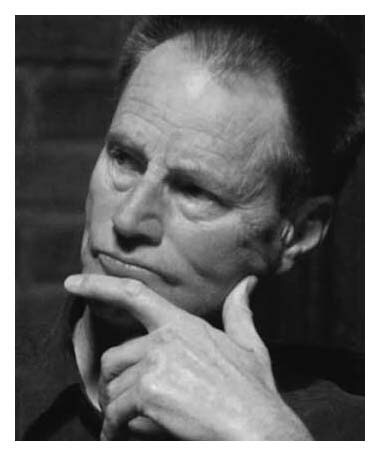 "I watched Sam Shepard on the monitor; tall and slinky with that wild crown of hair and those primitive eyes. He still has the outdoor boyish look like he just walked up from the lake." So the homeowner ultimately met Sam and discussed horses. No surprise here. 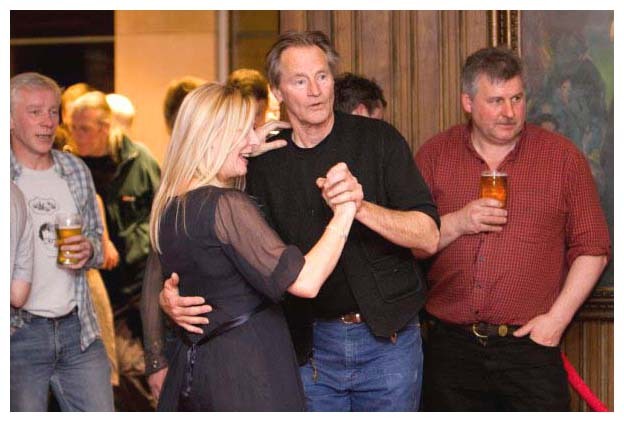 It was noted that Sam was "a kind man, a good listener and a good storyteller." Details of the New Group's 2009-2010 Off-Broadway season have been announced. In January 2010 there will be a revival of "A Lie of the Mind" directed by Ethan Hawke. The play originally opened at the Promenade Theater in 1985 and won the Drama Desk, Outer Critics Circle and New York Drama Critics' Circle Awards for Best New Play. Pittsburgh Playhouse will start its 2010 season with Sam's Pulitzer-winning "Buried Child". It will be directed by John Shepard (no relation) and will run from February 4 through February 21 in the Studio Theater. 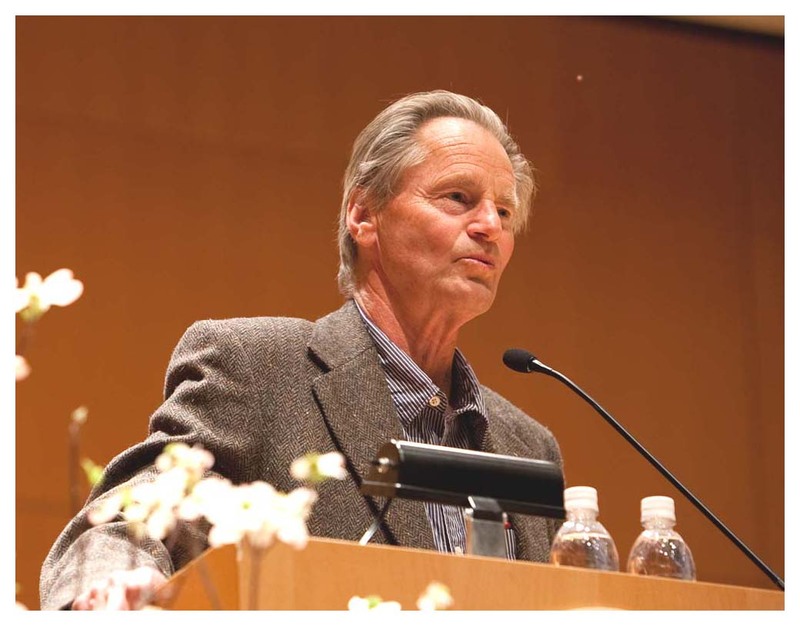 Each year the PEN/Laura Pels Foundation recognizes a master American playwright, whose literary achievements are vividly apparent in the rich and striking language of their work. 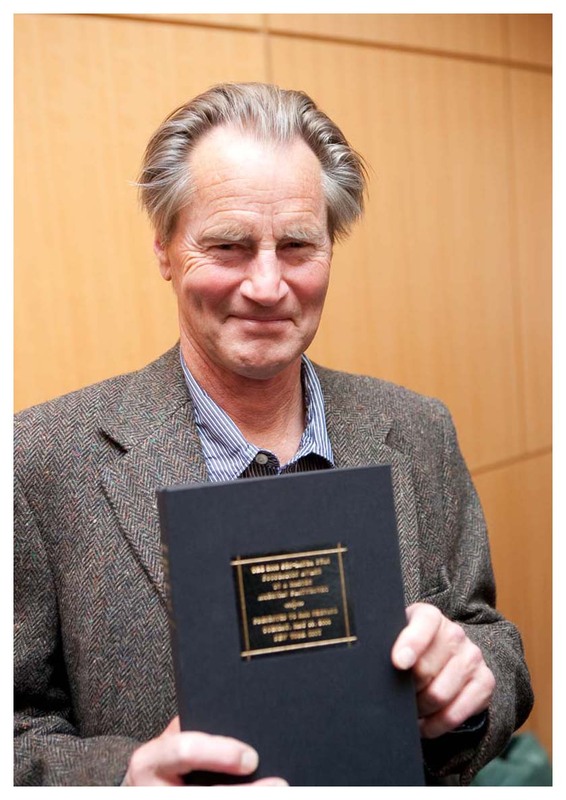 On May 4th PEN announced their 2009 Literary Award recipients and this year's Master Playwright Award goes to Sam Shepard. 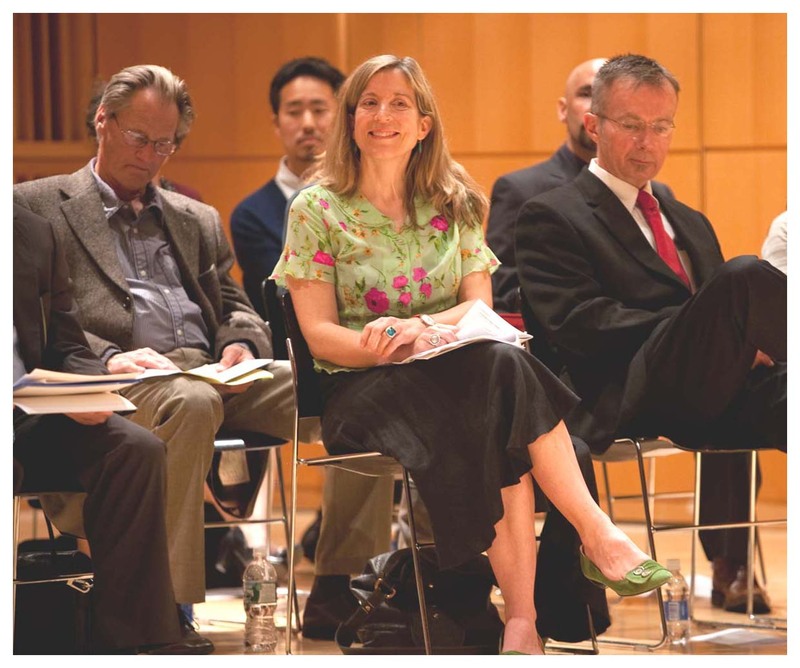 Novelists, translators, poets, nonfiction writers, playwrights, children’s book authors, and editors will be honored at a ceremony at Elebash Recital Hall at The Graduate Center, CUNY, on May 19, 2009. Sam's award will be a rare first edition of dramatic literature. Early last October it was reported that Jim Sheridan's BROTHERS, a remake of Susanne Bier's original 2004 film, was being bumped by distributor MGM out of its December 2008 slot to either a late summer or fall '09 release. Apparently Relativity Media has cut a deal to supply Lionsgate with five films annually, and "Brothers" will be the first to open under this new contract. David Benioff's script is about a younger "bad" brother (Jake Gyllenhaal) stepping into the familial shoes of his older "good" brother (Tobey Maguire) after the latter disappears during an enemy skirmish in Afghanistan. Natalie Portman plays the wife-mother whose loyalties shift, or at least adapt to new realities. Sam plays Gyllenhaal and Maguire's dad. Presented by The Sleepless Film Festival, Bob Dylan's rock epic RENALDO AND CLARA (1978) is now available online. Dylan has refused to screen or home release the film since its original, infamous debut. 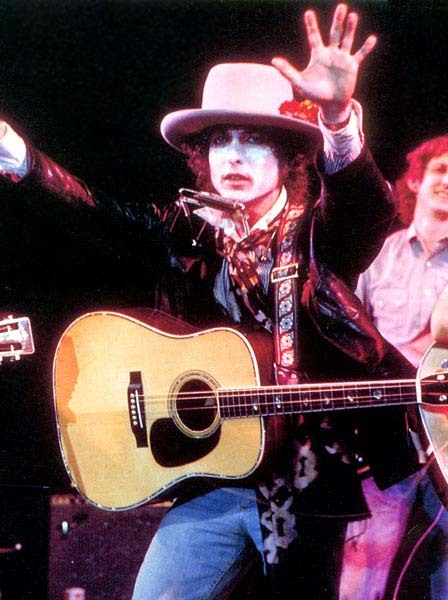 At nearly four hours in length, "Renaldo'" pairs live performances from The Rolling Thunder Revue. Sam was brought on as a screenwriter for the film, but ended up spending most of the tour taking enough notes to pen his classic "Rolling Thunder Logbook" - a great companion to the film. Dylan is ultimately credited with writing and directing the film. 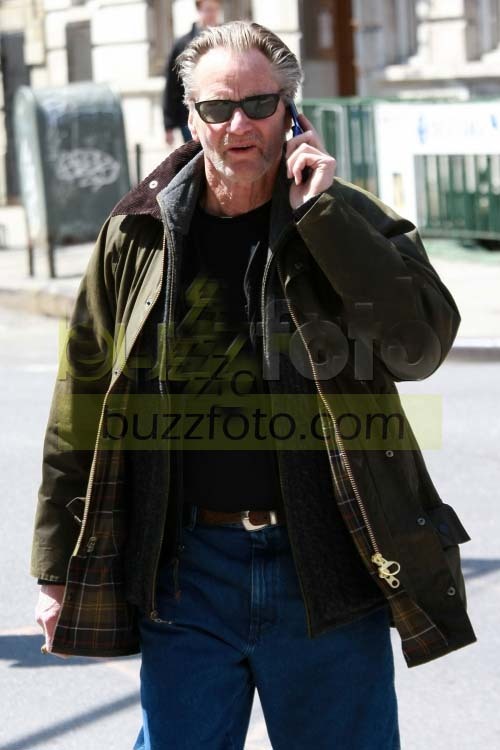 It looks like some photographer caught up with an unshaven Shepard talking on his cellphone in New York on April 17. "I still haven't gotten over this thing of walking down the street and somebody recognizing you because you've been in a movie. There's this illusion that movie stars only exist in the movies. And to see one live is like seeing a leopard let out of the zoo." The Abbey Theatre in Dublin has announced that AGES OF THE MOON will return to the venue for a two-week run in the fall. The play enjoyed a hugely successful run at the Abbey’s smaller space, the Peacock Theatre, and, due to an unprecedented demand for tickets, will transfer to the main Abbey stage from November 13 through November 28. Here are more photos taken at the premiere party last month. I've added a couple more reviews on the play, both positive. Theatre critic Colin Murphy of The Independent comments on Shepard's relationship with the Abbey and questions whether Shepard adds to Ireland's "National Theatre". Are his plays talking to the Irish as a nation or are they simply glamorous imports? Fiach MacConghail, the Abbey’s director, has said that a key reason to stage Shepard is because of the strong influence of Beckett in the playwright's work. Irish audiences can ‘get’ Shepard, in a way that, perhaps, other audiences can’t. Mr. Murphy writes, "Certainly, Beckett’s ghost is a looming presence in 'Ages of the Moon’, though Shepard seems gentler and more optimistic in his vision... There is another Irish connection in Shepard’s work: the theme of rupture with the land. His characters are familiar to us, even though their speech sounds like something from the movies: they are sundered from their (sometimes mythical) past, a time when they lived in synergy with a harsh environment. But do we need four productions to explore this?" Mr. Murphy points out that since Beckett has probably become the most influential playwright of the second half of the 20th century, being influenced by him is not novel, and although Shepard's work is "engaging and provocative", the theatre may be better served by featuring the host of Irish writers the Abbey has commissioned. While in Dublin, Sam had the chance to be a guest speaker at the Abbey's new Playwright Program, where he discussed everything from his love of Beckett to the differences between writing for the stage and screen. A participant reported this observation: " It’s interesting to get an outsider’s perspective on the state of Irish theatre, and Shepard is gushingly positive: nowhere else has he seen as many young people attend the theatre as he has here; he sees an unbridled force of creativity in Irish theatre that he hasn’t seen in the U.S since the 1970s; and he loves to work with Irish actors because they’re passionate about theatre, whereas in the U.S, actors often see theatre as a Purgatory they’re sent to between film shoots." With the recent premiere of AGES OF THE MOON in Dublin, The Irish Times published an article last month on how Sam may be theatre's heir to Irish-born playwright Samuel Beckett. You may remember that when a young Shepard arrived in New York, he was drawn to the Open Theatre and especially the work of fellow playwright Joseph Chaikin, whose main influences were Brecht and Beckett. 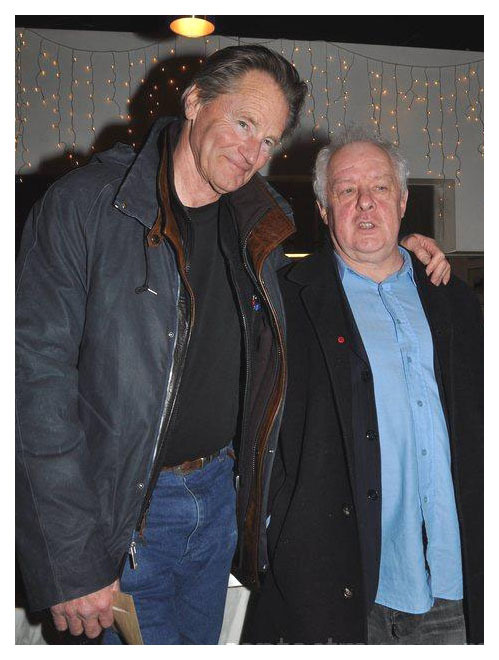 Sam eventually collaborated with Chaikin and a strong friendship was cemented. It comes as no surprise then that Sam has written two plays specifically for Irish theatre. The Beckett influence is based on the fact that Sam's plays "feel like musical experiences, transcend meaning, avoid the literary and conceptual and search for a concrete immediate reality, beyond the idea, which the actor and audience are forced to experience directly." Sam once said that Beckett made American theatre "look like it was on crutches" and that "he had revolutionized theatre, turning it upside down and making it possible to write about anything." When "Kicking a Dead Horse" premiered at the Abbey Theatre two years ago, the play began with a description of a dead horse with an insistence by Sam that there should be no attempt to stylize it or cartoon it in any way. 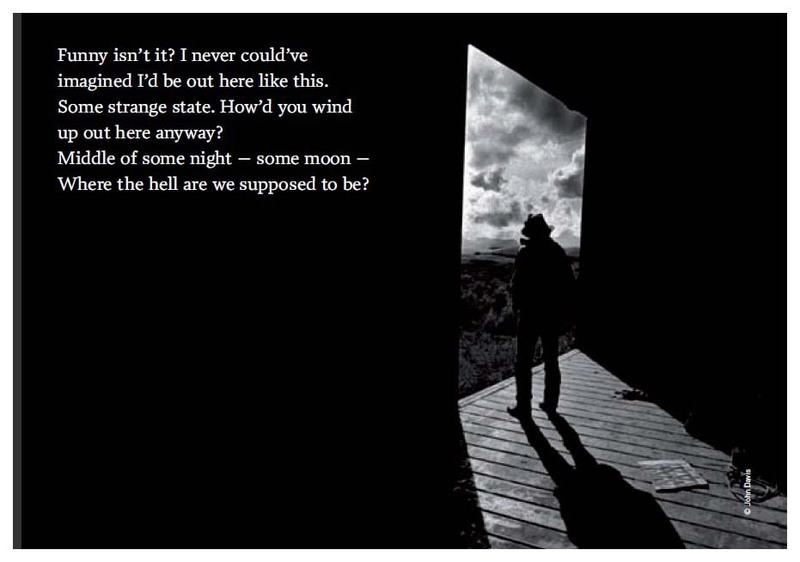 He continues to use that "Beckettian space and recreate it in rooms, ranches, prairies and, in the case of "Ages of the Moon", on the porch of a Kentucky-style, whitewashed brick country house." Helen Meany of The Guardian agrees. In her review of "Ages", she writes, "This sketchy, often poignant, meditation on aging and loss was written specifically for these two actors, and its pleasure lies in their interaction. Bound together by loneliness as much as shared memories, they are as uncomfortably yoked as any of Beckett's tragicomic duos." Here's some old news from last year but still interesting. 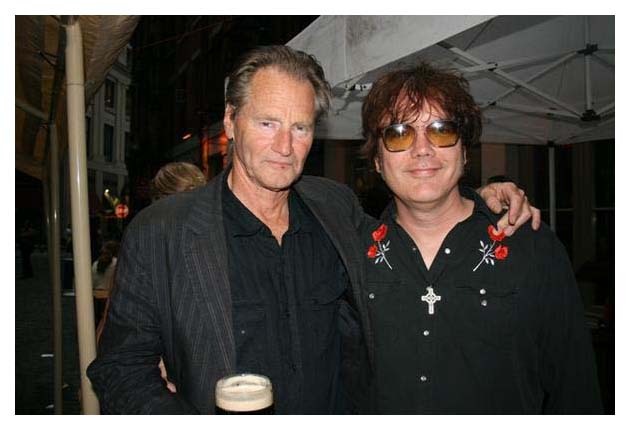 On June 16, 2008 Sam returned to his rock roots at the celebration of James Joyce's Bloomsday at the Ulysses Pub in NYC. 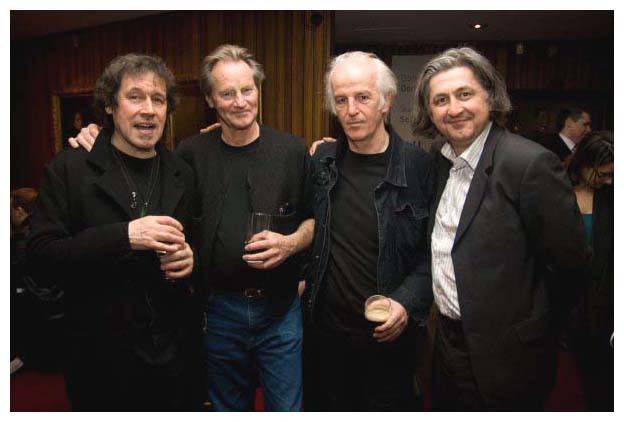 Sam, who once played in the Holy Modal Rounders, joined Joe Hurley on stage to the delight of his friend Stephen Rea. 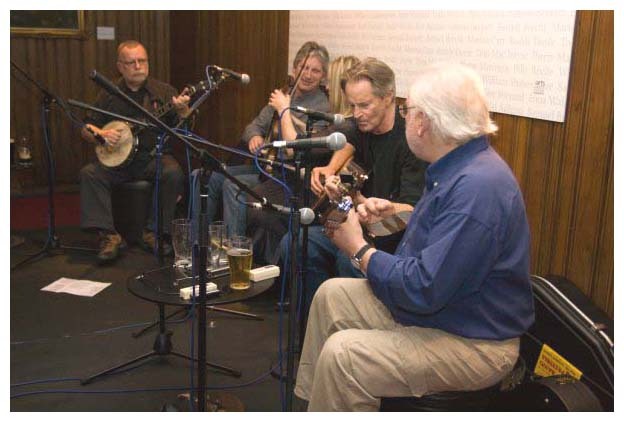 Hurley is a London-bred, Irish-blooded New Yorker who has performed over 1,000 shows. He is widely heralded for both the emotional delivery in his gravel-throated baritone, and his finely-tuned sense of lyrical detail. 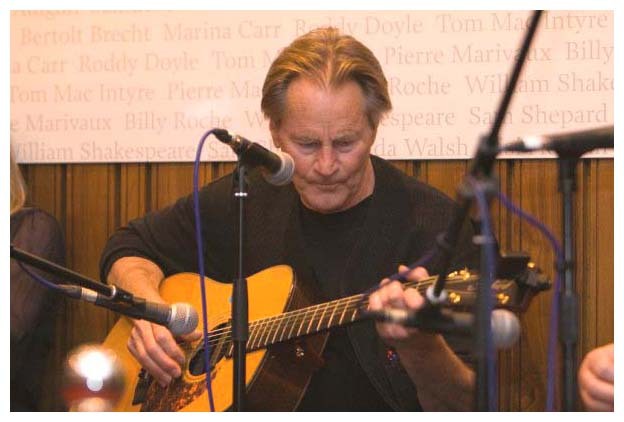 The singer/songwriter is the leader of two NYC groups, Rogue's March and Joe Hurley and the Gents. On this particular Monday afternoon, Sam and Joe sang Dylan's "Long Black Veil" and Johnny Cash's "Girl from the North Country Fair". Evidently their impromptu thrilled the audience. On Tuesday evening Sam was back in Dublin watching the curtain rise on the premiere of AGES OF THE MOON at the city's Abbey Theatre. Our playwright, dressed casually in an anorak and jeans, was given a warm welcome. 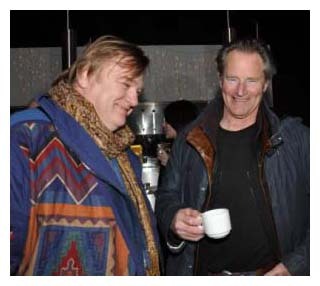 He chatted with theatre-goers as he sipped coffee at the bar of the adjoining Peacock Theatre before the performance. 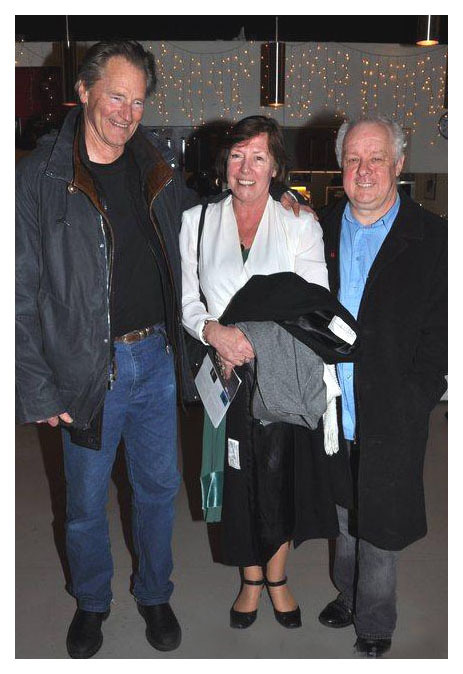 Attending the premiere were fellow actor Brendan Gleeson, filmmaker Jim Sheridan and his wife Fran (see photos below), singer-writer Roddy Doyle and songwriter Paul Brady. Doyle said he had great admiration and respect for Sam. He added, "His characters at one level seem to be very inarticulate but they're very clear about what they eventually want to say. So that is a story in itself, whatever about the plot, the characters eventually expressing that. I love that and admire that." Fiach Mac Conghail, the theatre's director, said Shepard has a strong and loyal affinity with the Abbey, having already written three sell-out plays for the historic theatre. It's nice to see that Sam finally got around to getting that chipped tooth fixed after all these years. Rumor has it that he was kicked by a horse last year and needed to see a dentist. John McKeown of The Independent praised Sam noting how the great charm of his writing is its allusiveness and delicacy in spare, man-eat-man situations. McKeown cites the unsentimental approach, perfectly tailored to Rea and McGinley's gift for dry, low-key acting. Peter Crawley of The Irish Times points out that both roles are tailor-made and nicely challenging. He writes, "Jimmy Fay’s unforced production allows echoes of a Beckettian inheritance, where behaviour is similarly clownish and poignant, and strikes an intelligent balance between a nameless American frontier and a more identifiably Irish stage tradition." RTE Entertainment's James McMahon states, "Shepard's play is not without its humour and the many one-word responses regularly hit the mark in the one-upmanship stakes. 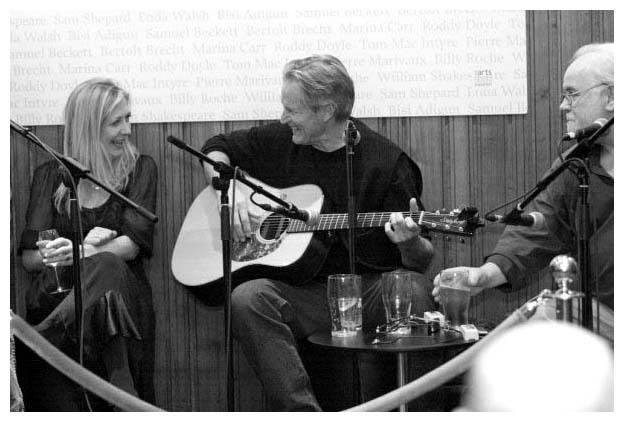 Both Rea and McGinley relish the opportunity to entertain the audience, without forcing the issue. Yet they are equally effective in eliciting the pain and anger of two men who are forced to consider their worth to society." You can read the full reviews here. There are no official reviews on AGES OF THE MOON though it opened to previews a week ago. The official premiere is tomorrow night. 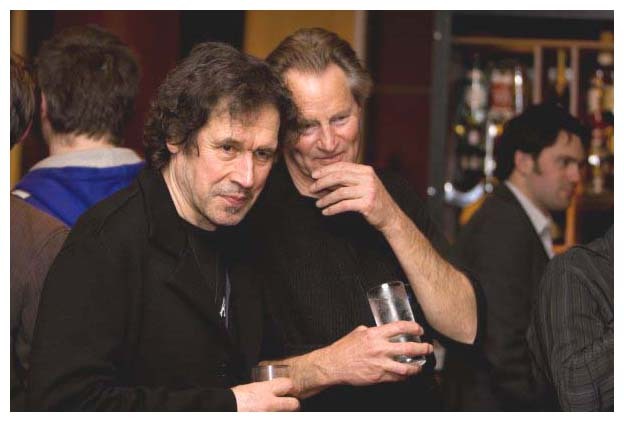 I did, however, come upon these comments on a short blog by someone who attended the play this weekend: "Written specially for Stephen Rea and Seán McGinley, the play sees two stunning performances by both actors. Set in an undisclosed 'sultry' state in middle America, the two men haven’t seen each other in years until Ames (Rea) desperately calls Byron (McGinley) to come and aid his drunken misery. The play is set on the day they reunite as they chat, joke, cry, argue and fight through their issues with each other and themselves. Ames is self obsessed and neurotic, traits that Byron deliberately monopolizes to annoy and irritate his friend. Byron is subdued and less eager to talk about himself... 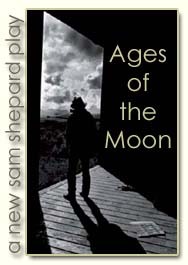 Both men are likeable but riddled with faults... 'Ages of the Moon' is a mesmerizing play not least because of the two actors’ performances but because of Shepard's amusing, engaging and surprising script." The Abbey Theatre of Dublin is presenting Sam's new play AGES OF THE MOON in another week. 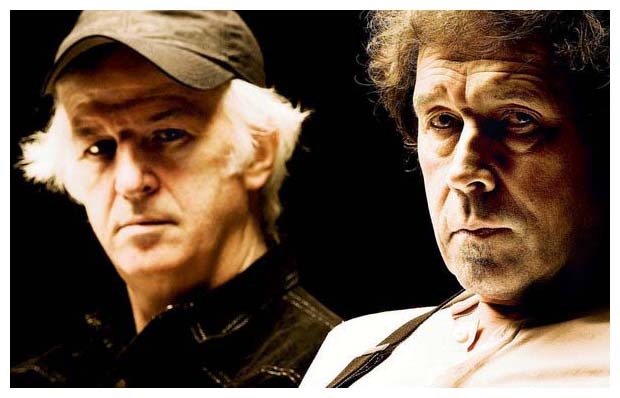 It's being staged by director Jimmy Fay at The Peacock in Dublin, Ireland with Stephen Rea and Sean McGinley. Previews begin February 24th with the play running through April 4. Fiach Mac Conghail, director of the Abbey Theatre, describes Shepard as a "playwright of international reputation". After the successful run two years ago of "Kicking a Dead Horse" with Rea, he was eager to premiere this new play. It's no surprise that the story is about two men (wouldn't it be interesting if he got inside a woman's head for a change?) 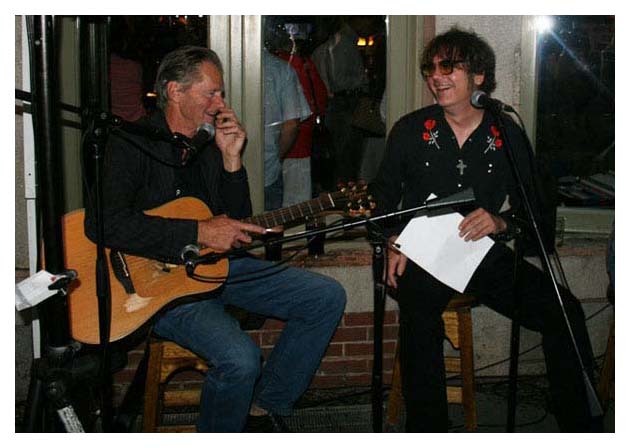 Two old-timers named Byron and Ames, who had once been boyhood friends back in the sixties, get together to commiserate about their lives and what their dreams and hopes had been. They drink, sit, reflect and bicker. No horses this time, but there is a gun. It's a play about memories. It's a play about fragility. It's a play about friendship. Rea has said that Sam's work has been influenced by Beckett. He explains, "Beckett never talked about meaning. He was always concerned about rhythm. I think the same is true about Shepard." He adds that "Ages" has certain tragic qualities calling it "imaginative" and "sensual". I'm willing to take a guess that the title of Sam's new play comes from the Irish poem "The Song of Amergin". I am a word of science. I am a god who creates in the head - the fire. Who but I knows the secret of the unhewn dolmen? Who enlightens the assembly on the mountain, if not I? Who but I, telleth the ages of the moon? Who but I, showeth the resting place of the sun? 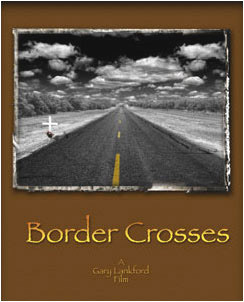 Sam is set to play the lead in an indie film called BORDER CROSSES. Produced by Michael Mailer Films and directed and written by Gary Lankford, the film will capture Sam's classic western looks as Texas rancher Walter Gaston. Filming should begin later this fall. Does this guy look the part? Here's the synopsis: On a warm fall afternoon in the badlands of South Texas, best friends Lon Townsend and Bucky Tompson climb into a pickup truck for what starts out to be a fun weekend trip to the border town of Piegras Negras (Black Rock). Little do they know, before the trip is over they will have changed their lives forever as well as the lives of everyone they run into. 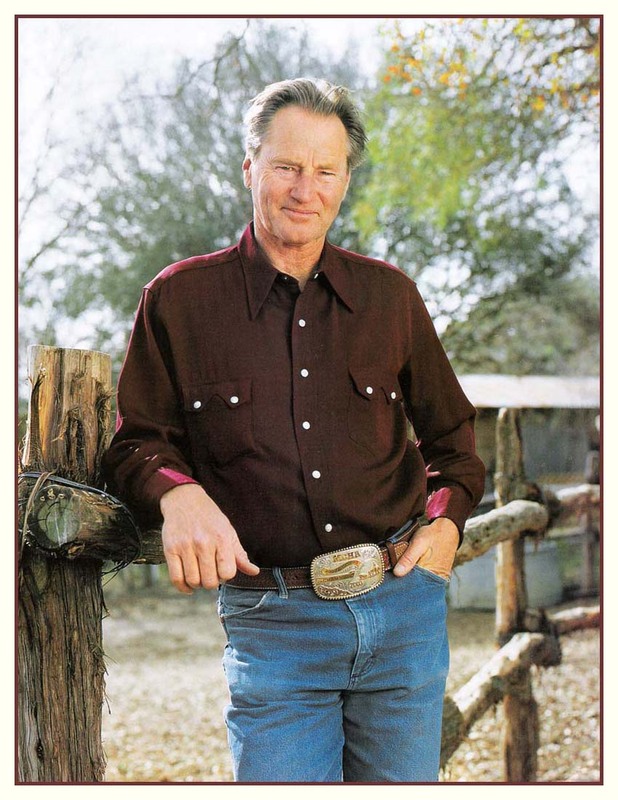 Lon finds in Walter Gaston, a rancher/attorney, the friend his father never was and the direction his life never had. Facing the toughest battle of his life, Gaston displays the toughness he has always known and finds the heart he has often neglected. Set against the backdrop of the wars being fought along the Texas/Mexico border everyday, wars pitting multi-generational Texas ranchers against money depraved Mexican drug runners, Lon and Gaston learn to live with dignity and to die with honor and that it is never too late to love. This is a story about Good vs. Evil and the consequences when their borders cross.